A still taken from a video of a train surfer. Photo: ProRail. 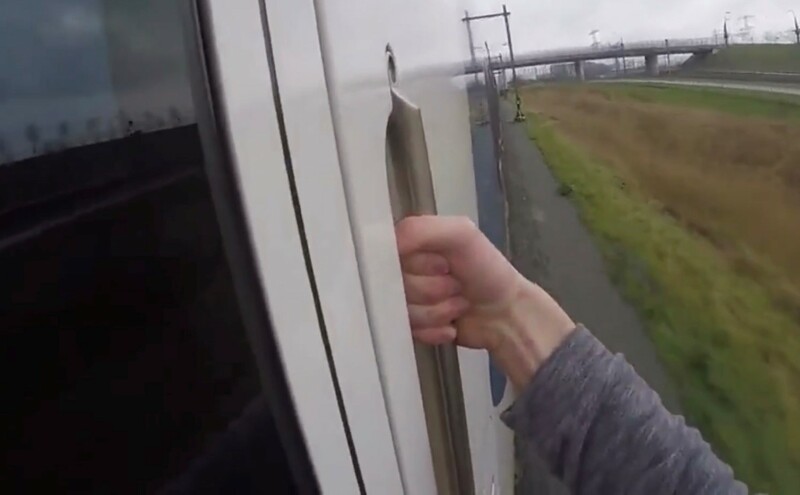 ProRail has called on YouTube to remove videos of train surfers quicker to prevent copycat behaviour. The Dutch railway infrastructure manager said that it has seen more and more videos of vloggers undertaking life-threatening stunts around the track being uploaded to the site. The request to YouTube follows a recent video of someone train surfing – the act of riding on the outside of a moving train – being uploaded, which made national news. In a statement on its website, ProRail said (Translated from Dutch): “According to YouTube policy, videos showing dangerous actions may be permitted if the main purpose of the video is educational, documentary, scientific or artistic. “According to ProRail, a train surfer is none of this. Meanwhile, YouTube has removed the video, but it is very annoying that these kinds of videos can sometimes be online for days.